In recent years, there has been an increasing trend in Cyprus of parents seeking alternatives to the current offerings in both the Public and Private Schooling sectors. From project-based learning to Montessori and Waldorf, we are seeing a growth of these types of schools being offered not only at Kindergarten level but also at a Primary (Elementary) one in Cyprus. We’re very pleased to have with us today Vivian Markovich, talking to us about Waldorf education and how it can benefit all children, through cultivating their sense of self, helping them build a meaningful world-view for themselves and a strong sense of their place within the World they inhabit. 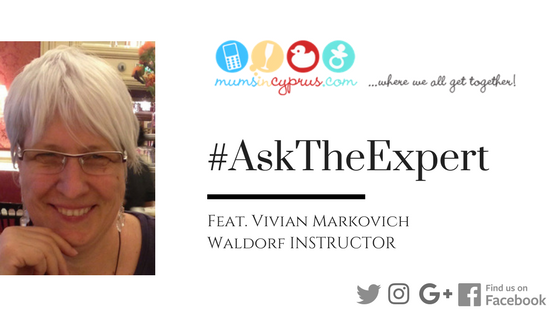 Vivian Markovich has been involved with Waldorf Education for over twenty years; first as a parent of two young boys attending the Perth Waldorf School in Western Australia; later as a Waldorf homeschooler in Bhutan and finally as a certified Waldorf Class Teacher in British Columbia, Canada. She most recently taught a mixed age-group of children (from Grade 5-7) in a yurt on a farm property on Vancouver Island. She has made two recent trips to Cyprus this year, to assist with planning of the new Waldorf Initiative which is opening in Limassol in September 2017. What is Waldorf Education and how does it differ from the education provided in mainstream schools? Waldorf Education has the stated goal “to produce individuals who are able, in and of themselves, to impart meaning to their lives”. Waldorf Education aims to be an education of the “head, heart and hands”. Another way this has been expressed is that it is concerned not only with academics but with the development of the child’s “thinking, feeling and willing (or doing)”. Arts and activities are used in the teaching of academic subjects and they are also taught in separate classes where visual art, music and drama are subjects from early elementary school. Waldorf Teachers seek to develop in their students an internal motivation to learn, doing away with the need for competitive testing and grading. What are some distinctive features of Waldorf Education and where can we find out more about Waldorf Education? A useful website for information about Waldorf Education can be found here. Academics are de-emphasized in the early years of schooling. There is no academic content in the Waldorf kindergarten experience (although there is a good deal of cultivation of pre-academic skills) and minimal academics in the first grade. Literacy readiness begins in kindergarten with formal reading instruction starting in grade one. Most children are reading independently by the middle or end of second grade. During the elementary school years (grades 1-8) the students have a class (or “main lesson”) teacher, who stays with them for a number of consecutive years, developing a close relationship with the pupils and providing a secure and consistent environment. Certain activities which are often considered “frills” at mainstream schools are central to Waldorf schooling: art, music, gardening, and foreign languages (usually two in elementary grades), to name a few. In the younger grades, all subjects are introduced through artistic mediums, as children usually respond better to this medium than to dry lecturing and rote learning. All children also learn to play the recorder and to knit. There are no “textbooks” as such in the first through fifth grades. All children have “main lesson books”, which are their own workbooks which they fill in during the course of the year under the class teacher’s guidance. They essentially produce their own “textbooks” which record their experiences and what they’ve learned. In some schools upper grades may use textbooks to supplement skills development, especially in maths and grammar. Learning in a Waldorf school is a non-competitive activity. There are no examinations or grades given at the elementary level; the teacher writes a detailed evaluation of the child at the end of each school year. The use of electronic media, particularly television, by young children is strongly discouraged in Waldorf schools. Sounds interesting, but is this education a new idea? Where has it been tried out before? How will we know it will be effective (and that my children will learn important skills and develop the understanding necessary for further study)? Waldorf Education is now well established as it was begun in 1919, when Rudolf Steiner, the Austrian philosopher, scientist and artist, was invited to give a series of lectures to the workers of the Waldorf-Astoria cigarette factory in Stuttgart, Germany. As a result, the factory’s owner, Emil Molt, asked Steiner to establish and lead a school for the children of the factory’s employees. – the teachers, those who would be working directly with the children, should take the leading role in the running of the school, with a minimum of interference from governmental or economic concerns. Molt agreed to the conditions and, after a training period for the prospective teachers, die Freie Waldorfschule (the Free Waldorf School) was opened on September 7, 1919. Currently, there are about 1,000 schools in 60 Countries. There are 232 Waldorf (or Rudolf Steiner Schools) in Germany, over 100 in Sweden, and over 150 in North America. There has been great growth in Waldorf Schools in China with over 40 being established since the first opened in 2004. 91% are active in lifelong education. 82% care most about ethical principles and value helping others in the workplace. As a parent myself, I know how important it is to feel that you are leaving open the doors of educational and career opportunity for your children. However, we don’t want to forget something of even more importance – the building up of the character, social skills and confidence of the person who will be knocking at that door. Why do people send their children to Waldorf Schools? The main reason is that Waldorf schools honour and protect the wonder of childhood. Every effort is expended to make Waldorf schools safe, secure and nurturing environments for children and to protect their childhood from the harmful influences of our rushed and increasingly hectic and over-stimulated world. Secondly, Waldorf education has a consistent philosophy of child development underlying the curriculum. All subjects are introduced in an age appropriate fashion. Finally, Waldorf schools produce graduates who are academically advantaged with respect to their public school counterparts, and who consistently gain admission to top universities. What does it mean to say that children develop creativity in Waldorf School? Creativity comes from within, it is a result of being open to the experiences with which the world presents us, of having the ability to reflect on what one has experienced and then, of having the confidence and skill (developed through time) to reintegrate that personal experience and reflection back into the world. Because we have a slower pace within our classrooms there is time for children to thoughtfully take their experience into themselves, and time for reflection on the meaning of that experience. Because the children are exposed to the Arts in many forms there are a wide variety of means for self-expression available to them as a result of this education. Children in primary schools are taught to play the Lyre and Wooden Flute and singing is a daily event throughout the day. In the visual arts, Drawing, Painting and Sculpture are taught from primary school onwards. Drama and Puppetry are also part of our classroom experience. Is Waldorf Education, with its emphasis on the Arts and Practical Activities, better suited to purely artistic children, or those who are not academically inclined? While children who have artistic talent will find a fertile ground for exploration in the Waldorf School and practical activities such as gardening, cooking and handiwork are ideal for active learners to have an “out-breath” in the afternoons, it is my view that Waldorf Education has something to offer all children. I have sometimes thought that Waldorf Education’s gift of taking time and encouraging deep interaction with the material presented is almost more appreciated by the children often labeled as academically ‘gifted’ – the very children whom modern education sometimes pushes to learn more and more at an earlier and earlier age. When these children are not asked to grind through large qualities of repetitive material, moving as quickly as they can from one ‘goalpost’ to the next- they are able to interact with what is presented in a thoughtful manner, making associations between what they have heard and what they see in the world around them. This habit of building a rich interior landscape from the carefully chosen materials of what is presented by their teacher, allows them to build a meaningful world-view for themselves and a strong sense of their place within that. In this manner Waldorf Schools seek to meet that goal with which we started this interview. I would like to invite anyone with further questions to contact the group currently beginning a Waldorf school in Limassol. The school will open this autumn in September – initially sharing the premises of the American Academy on Lefkas Street. We are planning at least one mixed age group class, and will be accepting enrolments from Grade 1 – 4 (ages 6-10) at present with plans to expand. Thanks for speaking with us today, Vivian, and for sharing your insights gained from a lifetime of involvement in Waldorf teaching. A great deal of what you said resonated with us, particularly the part about children being given the time to reflect on their experiences, to construct a meaningful world view and to reintegrate that personal reflection back in to the world… More and more we are realizing the need to slow down, breathe and practice mindfulness in our daily interactions with people and the world around us. It sounds like Waldorf education allows children to do this not only at home, but within the home-like, secure environment of a school, especially considering the amount of time children spend in formal education every day. We look forward to seeing the progress of your Waldorf initiative in Cyprus and to talking to you again further down the line! If you would like to know more about the Cyprus Waldorf School, you can visit their website or Facebook page @CyprusWaldorfSchool.